Set among the lush hills of the Jato valley, it is, together with Contessa Entellina, Mezzojuso and Palazzo Adriano, an important Albanian colony in Sicily dating back to the XV century, which still preserves its ethnic, linguistic and religious identity. 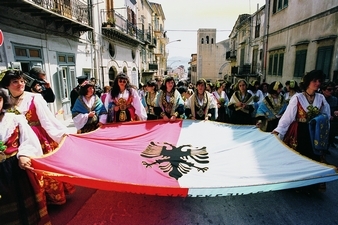 Religious rites are particularly interesting: the church of Piana, Christian and catholic, retains Greek-Byzantine rites, and during the celebrations, priests (papas), wear the typical black cylindrical hat, using both the Greek and Albanian language. Religious feasts such as the Epiphany, Palm Sunday and the Holy Week, which ends on Easter Sunday with a parade of pious people wearing their traditional costume. Piana has an amazing artistic heritage, featuring iconostasis by Greek authors and frescoes by Pietro Novelli, housed in the main churches of the town. Among these, don’t miss San Giorgio, the most ancient one, San Demetrio’s Cathedral, the Greek rite Mother church and the XVI century Santa Maria Odigitria built on a plan by Pietro Novelli, where the Odigitria icon brought from Albania in the XV century is. You cannot leave Piana without tasting one of the typical food products of the area: bread baked in ancient wood-burning ovens and cannolo, a cake filled with ricotta. Piana is also a good starting point to reach the splendid Lake, on whose shore is also an area equipped for picnics, and the Oriented reserve of the Serre di Pizzuta, where foxes, porcupines, rapacious birds, and a large colony of cloughs live.